1,Simple structure, small size, light weight, only half weight of clutch motor and DC motor at the situation of same power. energy saving compared with the clutch motor, and low noise and less heat. 3,Powerful torques: More than 10 layers 600D Oxford cloth can be sewn, electronic brake technology, point needles, precision braking, operation agility, comfort, easy, fast, energy saving, safety, environmental protection, quiet, many functions with one machine. Compared to the clutch motor, there is the advantage of low speed and high torque. 4,This motor is no carbon brush design, no sparks security, long-term use without any parts replacement, have small Interference to other electronic equipment during working . 5,Wide application and can replace all the clutch and motor under the power of 500W ,suitable for clothing, leather handbags, shoes, bags, sofa, toys and other industries. 7,You can back the investment cost within a year, an investment in a lifetime! Clutch motor is the AC induction motor, the output power is about 70% of input power, transfer torque through the friction clutch to the sewing machine, efficiency is only around 70%.Therefore, the real power for the sewing machine utilization rate is only about 50%. 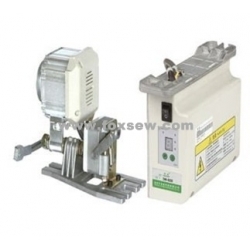 The energy-saving motors is a DC servo motor, the power utilization for the sewing machine up to 90%. 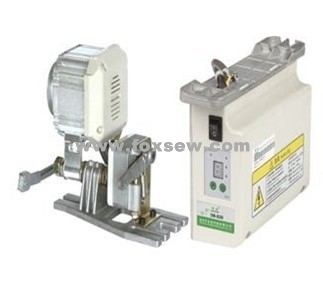 Normal clutch motor , the power supply it will operate, (ie load electricity, feet do not step on and power consumption), while the energy-saving motors can be synchronized with the sewing machine, sewing machine stopping power, and motor stopping power (ie no load power consumption)the energy saving motor are 60~85% than normal clutch motor.